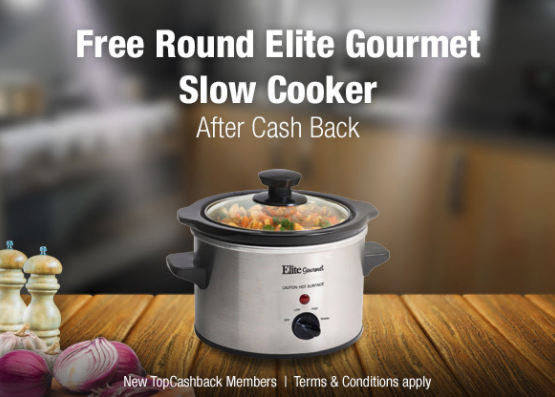 Home > Free > FREE Round Elite Gourmet 1.5-qt Slow Cooker! FREE Round Elite Gourmet 1.5-qt Slow Cooker! Until September 22nd you can score a completely FREE Elite Gourmet 1.5-qt Slow Cooker!! Head over to TopCashBack.com and create a new account. Click the “Get Offer” button on this page. Checkout at Walmart.com with the Elite Gourmet Slow Cooker for $12.32. You’ll get your cash back in your TopCashBack account within 14 days! Select to get it sent straight to your bank account or get a 3% bonus back when you choose to get it back as an Amazon or other gift card! Note: This is only good for first time TopCashBack members. If you are already a member you can share the deal with friends (or even your husband) but you aren’t eligible for the freebie. This offer ends Friday, 9/22, at midnight or while supplies last at Walmart.